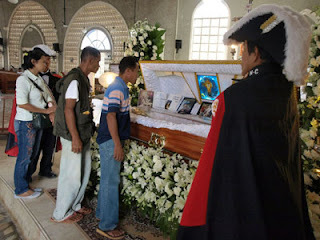 KIDAPAWAN CITY (Mindanao Examiner / Oct. 24, 2011) – The body of murdered Italian missionary Fausto Tentorio was brought to Kidapawan City in Mindanao where Filipino supporters and Christian worshipers continue to flock to see his remains. Gunman shot Tentorio on October 17 while about to board his vehicle outside a Catholic convent in the town of Arakan in North Cotabato province. The priest, a member of the Pontifical Institute for Foreign Missions, was a known anti-mining advocate who defended the ancestral rights of tribesmen in the province. President Benigno Aquino ordered authorities to hunt down the killer of the priest. “Regardless of who did the crime, they will have to pay. That has been the direction of this administration from the start. You do the crime, you will be in jail,” Aquino said. Father Tullio Favali, also a member of the Pontifical Institute for Foreign Missions, was also killed by a government militia Norberto Manero, Jr. in North Cotabato’s Tuluan town on April 11, 1985. And Father Salvador Carzedda who was killed in 1992 in Zamboanga City, and in August 2001, gunmen also shot dead Father Rufus Halley, an Irish Columban priest, after a failed kidnap attempt in Lanao del Sur province in Mindanao.